The George Bailey Detention Facility is administrated by the San Diego County Sheriff’s Department. It is one of four separate facilities operating as the East Mesa Detention Complex. The other buildings are the East Mesa Reentry Facility, the East Mesa Juvenile Detention Facility, and the Corrections Corporation of America. George Bailey Detention Center is a maximum security facility and is the largest operated by the San Diego Sheriff’s Department. It has a capacity if 1,380 inmates and is equipped with a large staff of both sworn and civilian professionals. 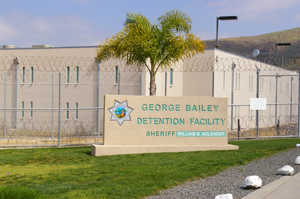 Like all the jails in San Diego County, the George F. Bailey Detention Facility’s visiting hours are determined by the area in which an inmate is located. Any questions or concerns may be directed to the office at 760-210-0386. Visiting reservations can be set over the phone at the number listed above, or via email. Remember to be at the jail for check in one hour prior to your visitation appointment. Once an individual is arrested, they are taken to the police station or jail for booking and processing. This is the procedure often depicted on television and in movies where photographs and fingerprints are taken, and a background check is conducted. Once complete, bail will be set for those who are eligible as per the San Diego County Bail Schedule. If an arrestee is booked and processed at a smaller facility and is not bailed out quickly, they will usually be transferred to a larger jail and will undergo the booking and processing procedure again. This can add upwards of 24 hours to their time in custody. As such, if you want them to avoid any extra time in jail, it is best to get the bail bond application process started as soon as possible. At Adventure Bail Bonds, a bail agent is available 24 hours a day, 7 days a week to take your call. Once you’re on the phone with us, we will need a little bit of information that will allow us to locate your friend or loved one and verify their eligibility for bail. Namely, we will need their full name, birth date and the date and time of arrest. It can help expedite the process by having this information ready ahead of time. Once all of this is complete, we will explain to you your responsibilities as indemnitor and you will need to sign the bail bond. After that, we will dispatch a bail bondsman to the jail to post the bond and get your friend or loved one released. We accept several payment options including: major debit/credit cards (American Express, Master Card, Visa and Discover), cash, check, money order, money wire and bank account transfer. If you have any additional questions about George Bailey Detention Facility or you want to get the bail bond process started right away, call us any time at 855-414-BAIL (2245). We know this can be a stressful time, and we’re here to help.